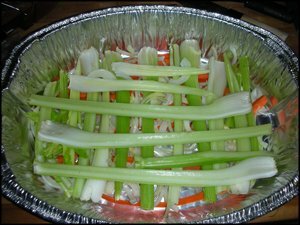 I wanted this last part of this series to be about what to do with leftovers but I decided to write about what happened this Thanksgiving. 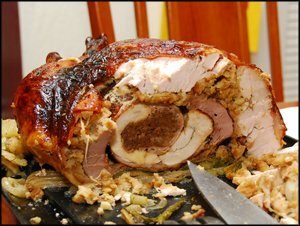 My brother brought the challenge of making a turducken this year and I accepted. This slightly changed my game plan, but I think things worked out in the end. I had to start a little earlier making this Frankenstein bird. Along with the turkey, I bought a duck and a chicken. Wednesday night I deboned the birds. 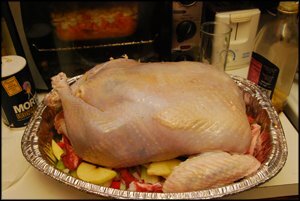 This was the first time to debone a turkey (I deboned a chicken and a Cornish hen once before). I must say that birds are birds, and their bone structures are relatively the same. 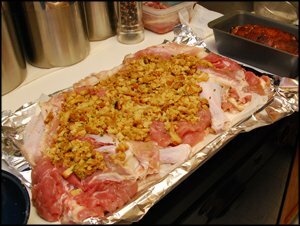 After deboning, I threw all the meat into the brine. I had to research how to make this thing. There are a lot of pictures and instructions on the net about what this thing is but are no real instructions on how to do it. I finally found this video: http://www.youtube.com/watch?v=w09F1Kt0U4Q. These guys looked like they know what they were doing, plus I liked the fact that they didn’t stuff a raw bird in a raw bird in a raw bird. However, they don’t tell you how long to cook the birds. 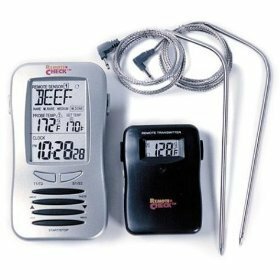 Whenever I roast anything I plug in my thermometer in it. According to the USDA Food Safety and Inspection Service, turkeys should have a minimum internal temperature of 165°F. As part of the change in my game plan, I didn’t make my red bell pepper soup this year. With the bones I got from the birds I made a soup stock, and made a turkey soup with onions, carrots, celery, sage, rosemary, turkey meat, and squash (pretty much, I chopped everything up, sautéed them and poured the stock). 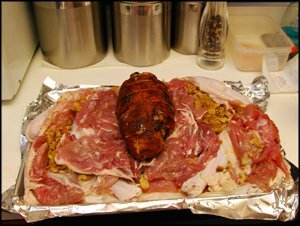 I didn’t make the pork shoulder since I made the turducken. I’m in a panic on what to make for Thanksgiving this year. All I can think of is what happened last year. Here’s a recap. Everything else worked out just as planned. I put other people in charge of dessert and drinks this year too. Too much work, too costly, and last but not least, too much meats. 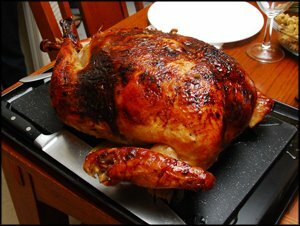 I usually roast turkey without stuffing, that way takes less time & easy to cook and tastier. 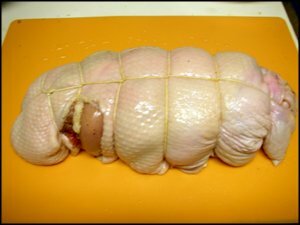 Just the deboning takes you hours, it looks great but takes too much time. Thanks but no thanks. I disagree with the above, I think it looks spectacular and would love to try it one day. Did it taste as good as it looks? 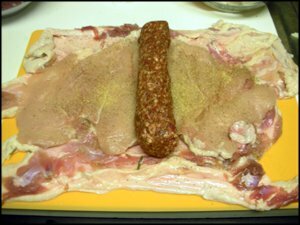 Anything with three meets, sausage and stuffing – not to mention all that skin – would have to taste good in my book. I’d like to have had a cross-section that matched the diameter of my plate (or even hung a bit over the edges… why not). One day I hope to be able to go through this process myself, or better yet, find a friend who does.